Experience the breathtaking beauty of the Caribbean with a sensational Dominican Republic holiday. Take your pick from our impressive range of 4-star hotels and resorts. Embrace luxury island life with a Caribbean holiday in the Dominican Republic. Browse our range of 5-star hotels and resorts and prepare for a tropical escape you will never forget. A holiday to the Dominican Republic combines stunning beaches with the potential for rainforest exploration and a memorable cultural experience. The Dominican Republic is known for its brilliant white sand beaches and luxury all-inclusive resorts, making it one of the prime Caribbean destinations for that luxury tropical holiday. The Dominican Republic also offer much more than that, though, with fantastic activities to entertain the active and sport traveller as well as rainforests and highlands inland and a fascinating Spanish colonial history. The Dominican Republic is a unique and varied destination offering a lot more than you would expect from simply a luxury Caribbean destination. 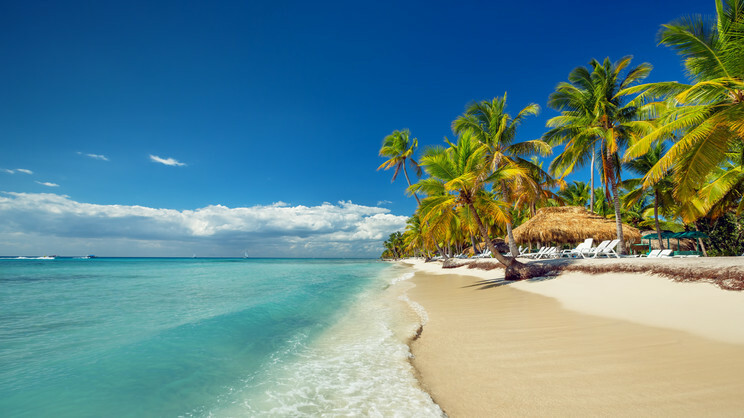 Flights: You can fly to the Dominican Republic from various UK airports, including direct options from; Birmingham, London, Bristol and Manchester. Packing essentials: June to November is hurricane season, where many golf courses and usual Dominican activities are a wash out, so you’d be advised against travel on those dates if you’re looking for great weather. If you decide to go during these dates you’ll need plenty of waterproof clothing. December to May can be hot and humid so pack accordingly. The weather in the Dominican Republic has some variation. December and May is the high season when the climate is relatively comfortable and the weather is drier. June is the month with the highest rainfall, with an average of 12 rain days. Hurricane season is between June and November and there is a risk of tropical storms, even though the locals and hotel staff are extremely experienced at handling this weather. If there is no storms it is still a great time to travel to the Dominican Republic. You’re looking for Caribbean luxury, combined with breath-taking nature and a culture like no other. That being said, the resorts on the north coast of the island are of a genuinely world class standard. With a variety of resorts to choose from all with pristine pearl-white coastline draped with palms and set against the turquoise waters of the Caribbean Sea. Luxury holidays in the Dominican Republic do not disappoint. Offering fabulous facilities and a great range of activities and dining variety. The north coast of the island is one of the Caribbean’s best coastal tourist draws for beauty and opulence. Playa Rincon is a famous beach a short drive from Samana. Consistently rated one of the top beaches in the Caribbean, Rincon is a three kilometre stretch of near perfect white sands set against a thick palm forest. A fabulous lazy day and some envy-inducing photo opportunities. To the east, the resorts of Punta Cana are beginning to offer stiff competition. This fast-growing part of the island is also blessed with beautiful beaches and some great golf courses and is another prime location for that all-inclusive beach holiday perfect to relax and unwind. For a more cultural experience, a trip to the capital of the island, Santo Domingo is a fascinating experience. The oldest European settlement in the Caribbean and the origin of the ‘New World’ this world UNESCO Heritage site offers a graceful mix of the modern and the past – a modern Caribbean city with a deep heritage. Cobbled streets and fantastic architecture in the Zona Colonial are abound. A trip to Santo Domingo is a great day out, and a must, while on the island. The island is great for more rural adventure, also. The inland mountains are some of the highest in the Caribbean region and offer some fantastic hiking and exploring opportunities. A surprise to most visitors, the mountain vistas are a beautiful reason to explore and offer a great variety to a beach based holiday. The same can also be said for the twenty seven waterfalls of Damajagua. Holiday makers routinely describe a tour of these waterfalls as an absolute highlight of their time on the island, experiencing these numerous cascades and again offers some spectacular photo opportunities. The Dominican Republic offers a variety that exceeds that of most Caribbean islands. With exceptional beaches and resorts, some fascinating towns and cities, and a lush and mountainous inland, the Dominican Republic is perfect for luxury holidays, family holidays and those seeking thrill and adventure. The Dominican Republic is an island of contrast that satisfies almost any holiday maker. For more information on the Dominican Republic holidays, call Destination 2 on and speak with one of our friendly and knowledgeable travel experts. With over 25 top class courses to choose from, the Dominican Republic is the go-to destination for keen golfers looking for some Caribbean sun. And make no mistake, these aren’t just any old courses, with PGA accredited greens which have been designed by some of the very best in the business; including Pete Dye, Gary Player and Jack Nicklaus to name a few. All that’s left now is to make sure you don’t forget those clubs...we’re sure you’ll have a ball. Perhaps surprisingly the Dominican Republic’s national sport is baseball. In fact, the country has the second most players in Major League Baseball (MLB) behind the US. David Ortiz, Robinson Cano and Albert Pujols are just some of the names to grace the sport in recent times, with a raft of World Series rings between them. Although the national leagues may not be up to the standard of the US, you’re sure to spot locals with bat, ball and gloves playing their favourite past-time. Although not as popular as Baseball, Basketball is huge in the Dominican Republic, with a few representatives appearing in the NBA. There is also a professional league in operation, with eight teams competing annually in a summer season. With 32km of beaches, it’s easy to see why Punta Cana has become so popular among holidaymakers visiting the Dominican Republic. The best of them without a doubt is Bávaro Beach. Here you’ll find a picturesque strip with golden-sand and that crystal blue water that only a select few beaches worldwide can boast. Further out to sea is a bunch of luxury boats and plenty of water sports. A number of 5-star chain resorts call this beach home and it’s not hard to see why. Bávaro may not be for every traveller, however, and that is where Playa Rincón comes into play. A remote beach on the Samana Peninsula, Playa Rincón, is best accessed via boat from Las Galeras. Palm trees are in abundance along the beach, while the cove ensures the water is always calm enough for you to swim for as long as you want. Bars and restaurants can be found nearby, meaning every amenity is covered at this true hidden gem. If you’re looking for a more action-packed beach outing then Kite Beach, in Cabarete, not only offers this, but also provides the opportunity for you to take in the incredible sight of hundreds of kiteboarders and windsurfers out on the water. If you wish, you can even join in the fun. Party hard with the locals when Carnival comes around each February, culminating in one final hurrah on February 27th. This is the date when the Dominican Republic became independent from Haiti. There’s nowhere in the Dominican Republic that isn’t worth being during Carnival, but the biggest party is arguably in La Vega, where attendees dress up as the devil and hit each other with balloons. If it’s dancing through the streets, plenty of food and great music you’re looking for, head to the Dominican Republic at the end of February! Because one Independence Day isn’t enough, the Dominican’s celebrate again, this time marking the date they regained control from Spain on August 16th, 1863. Restoration Day, as it is known, sees the streets filled with colour as parades go on long into the night. Santiago, the city where the war with Spain began, is the place to be. Enjoy some Latino heat while listening to a wealth of local and international artists who come together each June, in Santo Domingo, for the Latin Music Festival. For a true Dominican music fix, there’s also Festival del Merengue that takes place between July and August. A fortnight to celebrate the world’s top merengue bands. Another notable mention goes to the Dominican Republic Jazz Festival which takes place on various dates across various cities. Her you’ll find some top-class jazz and a whole host of food options.